You may have toured the magnificent Marshall University Visual Arts Center in the former Anderson-Newcomb building downtown. In 2014, Reed was appointed the first director of the new Center. “A painter by trade,” she has “two decades of experience and administration at the Savannah College of Art and Design.” She is a strong proponent of using visual art and design to help transform historic downtown Huntington. The B’nai Sholom Sisterhood seeks to foster and further the highest ideals of Judaism as expressed through synagogue, to promote closer fellowship among its members, and in cooperation with the Congregation to be a mentor for religious, social and educational activities. Service has long been a tradition with the Jewish women of Huntington. 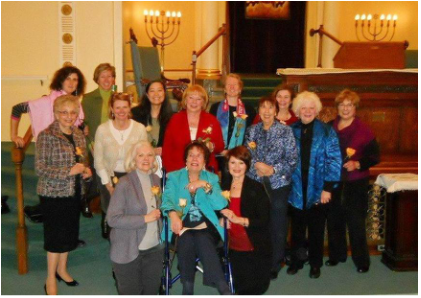 In the late 19th century, when the original Ohev Sholom congregation was founded in Huntington, twelve members of the congregation formed the Ladies Hebrew Benevolent Society, the precursor of today’s B’nai Sholom Sisterhood. The Ladies Hebrew Benevolent Society at that time sponsored and directed the Temple Sabbath School (religious school), as a regular activity of the Congregation. In 1913, representatives from the Ladies Hebrew Benevolent Society were part of 52 Congregational Women's groups who met in Cincinnati to organize the National Federation of Temple Sisterhoods (NFTS, now Women of Reform Judaism- WRJ). When the Ohev Sholom Congregation began moving in 1920 toward the establishment of a permanent house of worship, the Sisterhood took a very active role in raising funds for and in dedicating and preserving the building. In addition, the Sisterhood assumed a significant and essential role in the construction of the second and present Temple at Tenth Street and Tenth Avenue. The Sisterhood purchased the beautiful organ which enriches Temple services to this day. Their loyalty and zeal helped keep the Synagogue doors open during the lean years and dark days. They kept the Religious School going and helped make it possible for children to be confirmed in the days when there were no rabbis in Huntington. During World War I, members of the Sisterhood did canteen work, Red Cross work, and sold liberty bonds. Over time, whenever a financial emergency has arisen, the Sisterhood has gladly and generously shared their resources. Sisterhood supports numerous functions of the congregation including the Religious School, Judaica Shop, the library, youth activities, Holiday and Havdalah dinners, the Caring Committee, and catering for many congregational functions. Sisterhood holds monthly meetings which afford the members the opportunity to socialize with one another and the chance to enjoy stimulating programs. Sisterhood also has a presence in the general community through its yearly Tsedukah project and interfaith activities. These projects have included help and support for the homeless shelter, the battered woman's shelter, Lilly's Place, Hospitality House, Ronald McDonald House; Sisterhood members have also participated in building a Habitat for Humanity house.